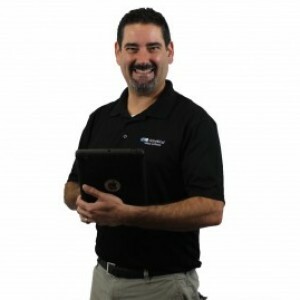 Wade is technically competent, courteously explains what he does and options. A professional. Cory was incredibly helpful, kind and thoughtful. It is obvious that he is knowledgeable about his work and takes pride in a job well done, from his preparedness in anticipating our water needs to Going the extra mile in clearly explaining our system and how it works. He gave us all of our options for fixing problems, explained the pros and cons of each solution, and didn’t pressure us to choose one option over another. We truly value his integrity and honesty in his work and hope that we’ll see Cory again when our softener and RO systems are serviced. Cory was fantastic! He was friendly, cheerful, and had anticipated what we would need and had it in the truck so he could grab it if necessary. 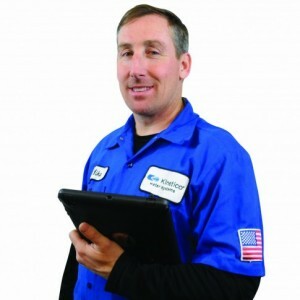 Cory clearly explained what was going on with our water softener and reverse osmosis system, gave me all the options to solve our water problems, and was upfront with all the pricing and payment choices. He made sure I understood everything, showed me exactly how everything worked and even talked with my husband on the phone to explain things to him as well. He went above and beyond his responsibilities to provide quality service at an affordable rate. Trevor came to my home to give my system it's six-month check up. He was friendly, courteous, and knowledgeable. His explanations of the "whys and wherefores" regarding the operation of my system, were in terms I could understand. Thank you for your help. Trevor was very helpful and professional. I went to the office to get a new filter, but the office secretary was gone for lunch and had closed the office during that time. I noticed a service truck with someone in it sitting off to the side of the building so I went up to the truck and it was Trevor. He was immediately willing to help. He even looked up my history with Aquarius and noticed that one of the parts we had on our system was needing to be changed out so he immediately follwed me home and changed out the part. It was great to have immediate service like that. He was very knowledgeable and explained everything that he was doing. I appreciate what he did to help me out. Travis came out for a service call on our sump pump that was running quite a bit. 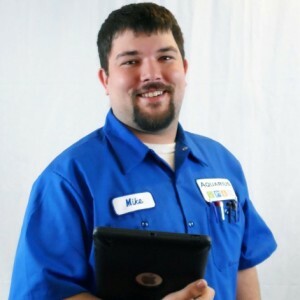 He was on time, very friendly and answered all the questions I had about possibly upgrading the system as well as some other questions I had about the home's plumbing since I had just moved in. He was a great first impression to Aquarius, and was a pleasure to work with. Cory installed a new sump pump and battery back up system for us in record time! He was so accommodating, answered all of our questions did an amazing job on the install. Trevor was amazing and he even brought his own rug! He wore shoe covers too! He was VERY knowledgeable and explained everything quite well. A very professional young man!! Great job by Will. Friendly, quick and knowledgable. Wade, our service person, and Aquarius are tremendous! I’ve had this system for almost 6 years and it’s been great and great service! Always had wonderful service and Trevor S did a great job! 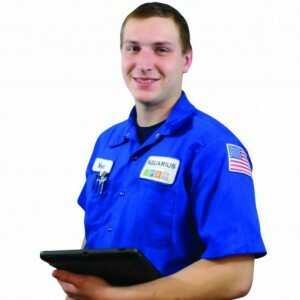 Friendly, knowledgeable techs. I would recommend Aquarius anytime. Great service and great product for our local water conditions! 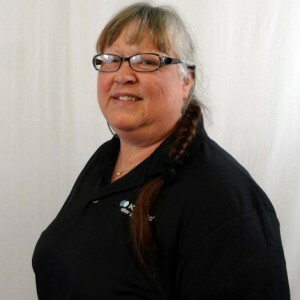 Erin R has a 5-Star rating and leads the company in total reviews, making this pro a ReviewBuzz Rockstar! Wade Wambolt is a true professional! He knows everything about Aquarius water conditioning. He answered every question we asked of him and he explained everything clearly. He's courteous, personable, knowledgeable hardworking and he keeps his truck and work space neat, clean and organized. THE BEST!!! The two representatives exceeded my expectations for courteous service and thorough explanation of my water system. e team at Aquarius is always polite, prompt and patient. Our city utility office conducted a city-wide plumbing inspection which required an additional valve installed on our Kinetico system. I called, was promptly scheduled, and although I wasn't available, my housemate met Jason and the service and education he provided her in learning to use bypass and maintain the system was excellent! Thank you again, Aquarius Team - it's always a pleasure working with you! Super Company. They have a good product, it works flawlessly, and they are always willing to answer your questions and provide assistance if needed. Recently, they helped me reattach the filter system when the original location for attachment was removed due to remodeling. They did this FREE. COURTESY. CUSTOMER RELATIONSHIP. I recommend this company at the highest possible rating. Aquarius Water does a great job at being experts in the water business. I find them to be thorough and complete. I flew from New York to our vacation home specifically to have this install occur and due to a miscommunication in needed parts, the install wasn't completed. Basically I wasted a $450 trip. Good mantenance & customer service. Disapointened that Kinetico did not solve tanin issue as originally promised. always great products and services I am very happy to have AQUARIUS as my water conditioner professional. Craig came out and showed us how much better our very hard water could be. We had a Kinetico softener in our last home and loved it, so Craig didn't have to try very hard to sell us another system. When I called the office with a few questions, my call was handled very professionally and with a friendly demeanor. 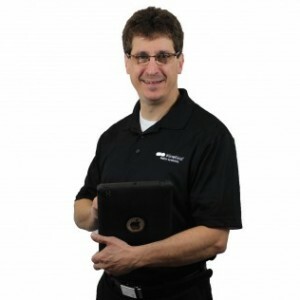 Adam was our installer and he was very pleasant and personable. He made sure to put on foot covers to protect our wood floors. He was very knowledgeable and answered our questions about installation. I never felt uncomfortable while he was in my home. I would definitely refer Aquarius to my friends and family. This service was for work that wasn't done to my satisfaction the first time. Jason A was pretty good at what he did to fix what needed to be fixed. Everything was done the way it should have been done the first time when he was finished. After installation was completed, there were multiple issues that weren't taken care of. 1. The old iron filter wasn't removed. 2. The plumbing that was done where the iron tank was deleted, was left hanging and was not supported to maintain integrity. 3. A couple of random things left on the floor and not thrown out. 4. Location of prefilter mounting was discussed with me over concerns for difficulty changing the filter after finishing of the basement walls takes place. I said as long as it is possible I have no problem. Well the filter was mounted where we talked about and the edge of the assembly sticks out a good 3/4" outside the face of the studs (where the Sheetrock will need to be) so that will have to get moved in order to finish that portion of the basement. So all in all, for the price I don't think I'm satisfied, but I hope the water quality makes me forget the rest of the things that were missed. All was very fast and professional. Joe and Mike were very helpful. Joe came out to do a tune up and found out that our current softener was no longer working correctly. He gave me great information on options to replace it. There was no pressure to commit to one from them. However we did decide to go forward and buy a new system from them. Mike came out and installed it for us. Mike did an excellent job installing the new one and removing the old one for us too. We will use this company again if/when needed. Everyone we had contact with during this time(Erin, Jason, Mike, and Adam) were super! The new Kinetico water softener is wonderful! Great experience overall. Product also speaks for itself. Noticed a difference instantly in our water quality. Aquarius has customer service figured out. Everyone we worked with on our purchase and installation went out of their way to ensure our complete satisfaction. Computer glitches that might have derailed some organizations, were handled deftly, swiftly and in such manner as to impress me with their concern for customer satisfaction. I must offer special recognition to Dave, our plumber/installer. His attention to detail and his drive to ensure the installation was done 'right', as opposed to just being done so he could get out of there impressed me no end. Probably because I see such qualities expended so seldom these days. Our installation proved more difficult than anticipated, and in my estimation Dave went above and beyond as we worked through several issues to find solutions. Never once did I hear a complaint; rather, he offered ideas, options and work-arounds designed to ensure our installation met both his, and our, high standards. I find, unfortunately, the superior level of customer service provided by Aquarius to be rather rare. They truly earned this superlative review. Jason did the installation of our water softner in a timely manner. He provided exceptional service and arrived on time. Explained everything thoroughly! I would definitely recommend Aquarius water Condtioning/Kenetico.